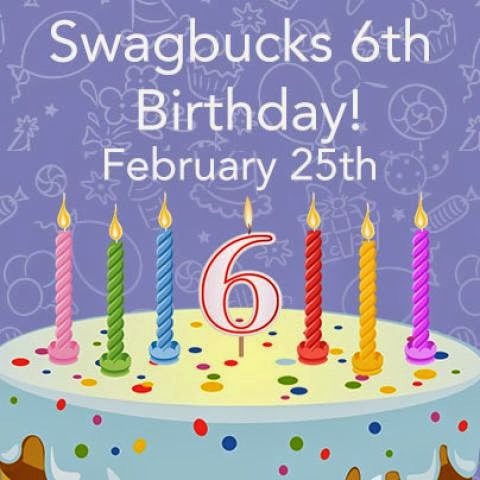 Browse » Home » Swagbucks » Happy 6th Birthday, Swagbucks! At the end of the day, the members of the 1st place team each get 50 SB. Don't worry, the other teams also get bonus SB: 2nd place: 30 SB, 3rd: 25 SB, 4th: 20 SB, 5th: 15 SB, & 6th: 10 SB. In addition, the top 3 earners from EACH TEAM get 500 SB, 250 SB, & 100 SB respectively. (All bonuses will be paid by Mar 7th.) Now that's what I call a party! But there's more: when you join a team, you'll have a chance to choose a birthday wish. As teams earn, each team's birthday candle will appear on the cake. When all candles have appeared and been lit, Swagbucks will announce the winning birthday wish. If you haven't signed up for Swagbucks yet to get free gift cards online, this is the BIGGEST earning day of the year and a great time to get started. Sign up here and RSVP to join the festivities. The party starts at 7am Eastern time, so get ready to celebrate and win BIG!